Harker’s swim school and athletic camp offerings provide summer campers with the opportunity to learn, refine and extend their abilities. Swimming lessons are serious business at Harker, and our knowledgeable, caring staff motivate and encourage campers using a variety of proven methods. The Harker Summer Swim School provides both children and adults the opportunity to learn, refine and extend their swimming ability in a noncompetitive environment full of positive reinforcement and encouragement. Our beautiful Singh Aquatic Center and friendly staff make our swim school a comfortable and safe place for swimmers of all levels and their families. Private and group lessons are available. Half-hour lessons scheduled consecutively (Mon.-Thurs.) give swimmers the opportunity to build skills. 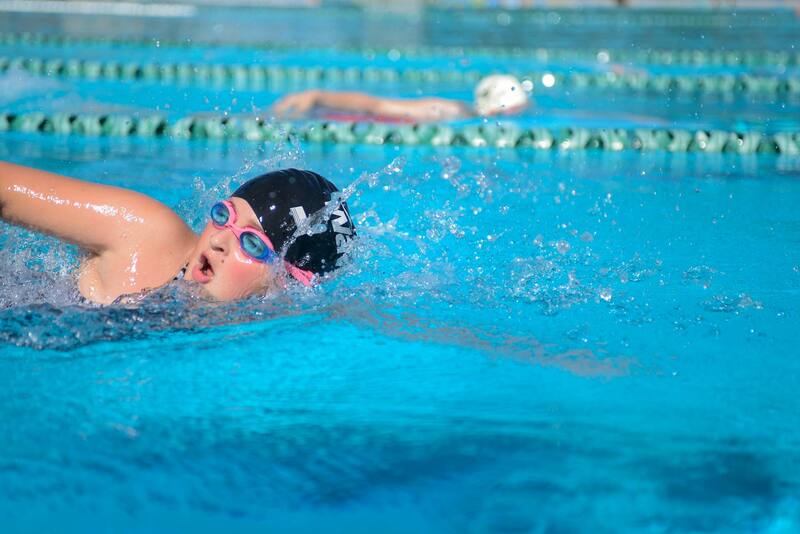 Lessons are designed to help swimmers develop their swimming ability in a logical sequence. Our caring instructors are trained to motivate and encourage learners using a variety of methods designed to build confidence along with swimming technique. Private and group swim lessons are offered to children aged between 5-18 years old. Adults and preschoolers (ages 3-4) may only participate in private lessons. June 17-Aug. 8 | Weekly | M-TH | 4-5 p.m. In this introduction to competitive swimming, instructors will focus on the following: circle swimming, use of the pace clock, understanding workouts and sets, beginning butterfly progressions, executing correct turns for all four strokes, and diving from a stand. Swimmers must have completed Harker Swim School Level 9 or be able to swim 25 yards in freestyle, backstroke and breaststroke, and be comfortable in all pool depths. This level is for non-swimmers who are nervous in the water. Students will learn to become comfortable and safe in the water. The use of positive reinforcement and praise will be essential to develop trust and confidence. This level is for students who have had some experience in the water and are comfortable moving around by themselves. The foundation of streamlining or gliding will be introduced – the basic body position for all strokes. The basics of freestyle, backstroke and sculling will be introduced. This level is for students who are able to float and glide on their front and on their back. The fundamentals of kicking will be introduced along with basic survival skills. This level is for students who are able to consistently flutter kick on their front and back for a distance of 15m. The basic freestyle and backstroke arm action will be introduced. Horizontal rotation will also be introduced in preparation for side breathing. This level is for students who are able to swim freestyle and backstroke over a short distance. Side breathing will be introduced. Students will continue to develop their sculling and survival skills. This level is for students who are able to swim freestyle with side breathing and backstroke for a distance of 15m. Breaststroke arm and leg action are introduced. This level is for students who can swim freestyle with side breathing, backstroke and breaststroke. Students will learn bilateral breathing and will focus on breaststroke and backstroke progressions. This level is for students who are able to swim freestyle and backstroke for a distance of 25m and breaststroke for a distance of 15m. The dolphin kick will be introduced in preparation for learning butterfly. In addition students will begin to learn elementary backstroke and different turning techniques. This level is for students who can swim 25m of freestyle, backstroke and breaststroke and are ready to focus on butterfly progressions. Students will execute a variety of entries and safe dives. Correct turns will be practiced for each stroke. Students will learn sidestroke and build on their survival skills. Register for Our Summer Swim School Today!